Bound by the picturesque Jerumelo, Sicó and Espinhal mountains, the green Rabaçal valley in central Portugal easily evokes romantic notions of a rural idyll. It comes as no surprise that the striking new 180 sq m single family home by Coimbra based João Mendes Ribeiro Arquitecto, is taking full advantage of this remarkable setting. Located on a small estate encompassing a vineyard and olive grove, Fonte Boa House is sensitively positioned on the western edge of the plot, its linear orientation maximising daylight and views, whilst carefully interacting with the gentle rolling topography. The gleaming white rectangular volume, which draws on traditional Portuguese dwellings, with a playful pattern of picture frame windows and a streamlined zinc roof, is rooted to the sloping scrubland by concrete pad foundations. Flush with the gable walls, this subtle support system enables the house to preside over the estate with marginal intervention to the landscape. The stark concrete retaining walls of the semi-sunken carpark are set in perfect alignment to the house, its elongated form providing an attenuated buffer from the main road. An external storage room is neatly incorporated next to a concrete stair that draws the eye towards the entrance. A simple palette of white walls and timber floors is used throughout the bright interior, with key features of the internal layout determining the position of the abstract window openings. Not always for view, low level windows cleverly emphasise critical junctions, however the pièce de résistance is the living room glazed wall, seamlessly slotted into a deep reveal, framing dramatic views out over the valley. 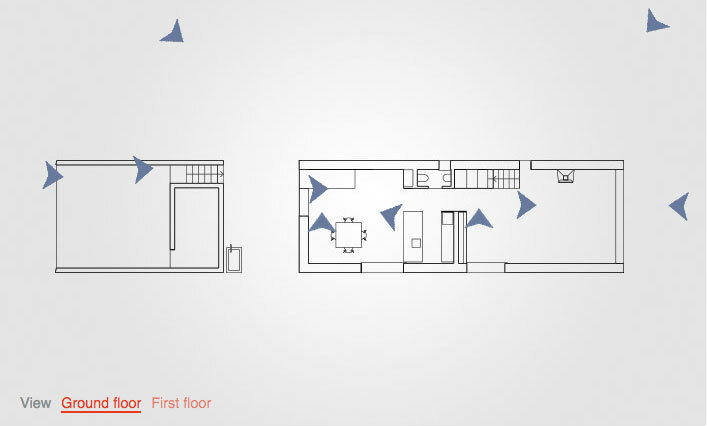 The internal arrangement of each floor is organised in three parts. At ground level, a central stair and kitchen divide the dining and living space. At first floor, a bathroom, office and hallway divide two bedrooms, with the pitched ceiling giving the impression of an almost gallery like space. Clutter, the enemy of minimalist design, is concealed with generously apportioned integrated furniture. The bedroom storage units align millimetre-perfect to adjacent door architraves, and the underside of the stair is filled with flush drawers and cabinets, allowing plenty of room to sit back with a glass of wine from the vineyard and appreciate the glorious setting. An external storage area is neatly incorporated into the carpark walls. The adjacent concrete stair draws the eye towards the entrance.